We have had an incredible 1.5 days thus far at the OLPC San Francisco Community Summit 2010. 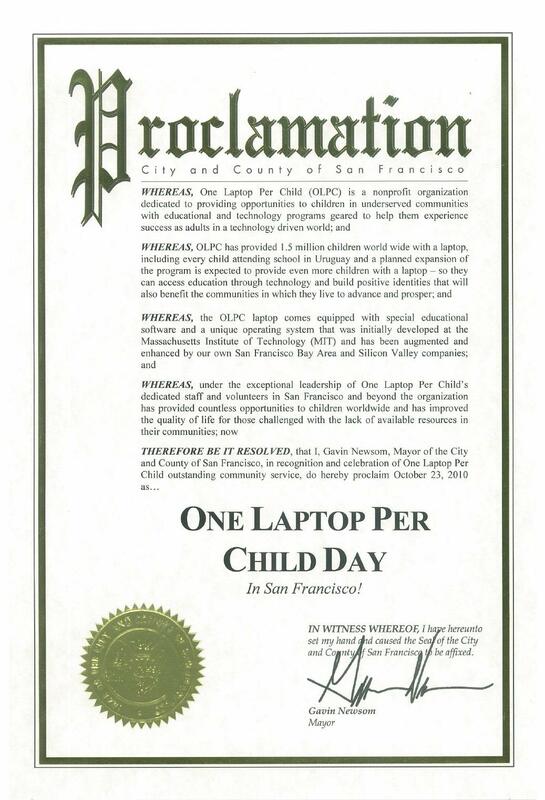 Mayor Gavin Newsom declared October 23, 2010 as One Laptop per Child Day in San Francisco! You can join us online today at 11:30AM and 13:45pm Pacific online with our live ustream video stream, and the notes from all sessions are now online on the wiki schedule. Tim Falconer and Waveplace are hosting the upcoming “realness summit” (about the realness of small independent pilots with XOs, which are quite different from OLPC deployments) on the Virgin Islands at the end of the month. It’s worth a look, though it aims to be offline – Internet junkies may have a hard time either attending in person (and suffering withdrawal) or following the four-day event on Twitter. Update: Waveplace also regularly recruits mentors to help run their school projects, and have put out a call for mentors for the coming year, with a minute-long video spot.